The last cross country skiing race in this Olympics is also the longest: The 30/50 km free technique mass start race. There are not many long distance races on the World Cup circuit – this is the first this season – and thus we might get some surprises here – especially in the men’s class. Below you find historical results from long distance mass start races in free technique. Main favourites are Marit Bjørgen, Charlotte Kalla and Therese Johaug – with Justyna Kowalczyk as an outsider. Also look out for Heidi Weng, Aino-Kaisa Saarinen, Elizabeth Stephen and Yulia Tchekalova. Main favourite is double gold medal winner Dario Cologna along with Alexander Legkov, Marcus Hellner (if he is well again after sickness), Martin Johnsrud Sundby, Johan Olsson, Petter Northug and Maurice Manificat. Outsiders are Chris Jespersen and Maxim Vylegzhanin. There is only one race in this year’s Olympics with interval start – the 10/15 km classic. This is the highlight of the Olympics for fans of the good old Cross Country skiing tradition – where it is up to the athletes to fight against the clock. The start list for the men’s race is not yet public (so some of the skiers mentioned below might not actually be on the start), but it is already known that a few of the big pre-Olympics favourites will not be on the start list. Actually the three last winners in classic interval start races in the World Cup are said to not be on the start list: Alexander Legkov (winner in the 15 km classic World Cup race in Toblach less than two weeks ago), Petter Northug (winner of the 10 km classic World Cup race in Val di Fiemme in early January) and Pål Golberg (winner of the 15 km classic World Cup race in Lillehammer in December). In addition 4th placed Vylegzhanin from the 30 km Skiathlon is also said to not be starting. Dario Cologna won the Skiathlon – and skied very well until he fell twice(!) on the sprint. 2nd in Toblach on the same discipline less than 2 weeks ago. Alexey Poltaranin is a real classic expert who has shown good shape several times this season – although he looked even stronger last year. Still – don’t forget his victory in the 15 km classic mass start during Tour de Ski in Lenzerheide and the 2nd place on the 15km classic interval start in Lillehammer in December. Martin Johnsrud Sundby – previously a specialist in classic interval start races – now even better in free technique. His last (and only) victory in a classic interval start race in the World Cup is back in 2008 in Kuusamo – he is still among the big favourites. Lukas Bauer proved in November with his victory on the 10 km classic in Kuusamo that he is back in shape for the Olympic season – although he has not impressed massively the rest of the season (only 15th in Toblach). Can be very strong – but could also fail. Eldar Rønning has been very good (2nd in Kuusamo) and far behind (31st in Lillehammer) in classic interval start races this year. Toblach (12th) was a step in the right direction. Rønning may be fantastic if he has found his top shape – but nothing is 100% sure for the Norwegian classic expert. Didrik Tønseth – 3rd in Lillehammer 15 km classic – may do it again in Sochi. Dark horses: Johan Olsson – says he is out of shape – may still be fantastic (winner 50 km mass start classic at World Champs last year), Matti Heikkinen (suddenly makes a fantastic appearance when not expected – count in the Finn! ), Ilia Chernousov, Chris Jespersen, Daniel Rickardsson, Marcus Hellner (great shape – classic not his specialty if it is soft), Dmitriy Japarov. In the women’s class we have the usual fight between Marit Bjørgen, Justyna Kowalczyk and Therese Johaug – with the addition of Charlotte Kalla who is actually a real gold candidate. The remaining Norwegians and the Finns will fight for the medals. Justyna Kowalczyk would normally be the big favourite in a classic interval start race, but the Polish skier has struggled with injuries the last weeks – and although she could turn out to be very close to 100% – there is a uncertainty with respect to her chances. Still a hot winner candidate. Marit Bjørgen showed at the Skiathlon that she is in top shape – and is probably the main favourite for the 10 km classic. Therese Johaug was not in her best shape at the Skiathlon – but she later said that she did not sleep all night due to the circumstances surrounding Jacobsen’s brother – and thus Johaug might actually be in top shape on Thursday. Count her in the fight for gold – if she has the early November shape of Beitostølen nobody can beat her. Charlotte Kalla impressed with a 2nd place in Lillehammer at the 10 km classic – only 12 seconds behind Kowalczyk and ahead of all Norwegians. And that with difficult and soft conditions. Another top classic race in Toblach with a 3rd place. Looking at her statistics – she has increased her capacity in classic significantly this year. Definitely a winner candidate. Aino-Kaiso Saarinen: Classic specialist who was on top on the 10 km classic in 2008-2009 – but showed on the Skiathlon that she is on her way to top shape. Can challenge the “Big 4″ for the medals. Gold seems impossible – but …. Astrid Uhrenholdt Jacobsen: Impressive shape this year – and has done some very good interval start races. Medal candidate! Heidi Weng: Another Norwegian medal candidate – finished 3rd in Lahti on the 10 km classic interval start race last year. Outsiders: Kerttu Niskanen, Krista Lahteenmaki, Ishida Masako, Yulia Tchekaleva, Nicole Fessel, Anna Haag, Sadie Bjornsen. The sprint is one of the most open disciplines in Cross Country skiing in the Olympics – especially in the men’s class where there have been 9(!) different winners in the previous 9 free technique sprints in the World Cup. The women have two big favourites in Kikkan Randall and Marit Bjørgen. The sprint courses in Sochi are tough courses with a very tough hill – especially for the men – said to favor distance racers rather than the pure sprinters. The altitude will also make a the race a tough one. Ola Vigen Hattested won the Toblach sprint – and has thus shown that he has peaked his shape at the right time. The course might be a bit tough for Hattestad – on the other hand the Norwegian is a real fighter. Alex Harvey won the sprint in Szlkarska Poreba in January. Not the biggest favourite – but definitely one of the many outsiders. Sergey Ustiugov won the Nove Mesto sprint earlier in January – a strong Russian who counts as one of the outsiders in the Sochi sprint. The Lenzerheide sprint (Tour de Ski) at New Years Eve was one by Simon Hamilton. The American is not one of the main favourites – but having one a free technique sprint this season he has to be looked out for. Calle Halfvarsson won the sprint in Oberhof (Tour de Ski) at December 29th last year. Also not one of the biggest favourites – but still among the outsiders. The Davos sprint in December was won by the Norwegian Anders Gløersen. Another outsider – Gløersen has also had some good distance race performances this year. Going back to last season (March), Swedish Emil Jönsson won the last free technique sprint of last season in Lathti. Jönsson has lost a few kilos to prepare for the Sochi courses – but has so far not impressed in the World Cup. Still Jönsson is among the favourites in Sochi. Petter Northug won the sprint in the pre-Olympics in Sochi last year – and has thus shown that he can perform very well on this tough sprint course. Northug was not strong enough to keep up the speed of the leading pack the last hill on the Skiathlon – but Northug says he is in shape. One of the big favourites! The last World Cup winner – Finn Hågen Krogh – was originally given a place on the Norwegian team, but was put out of the team after the win by Ola Vigen Hattestad in Toblach. Alexey Petukhov – a strong Russian who can take it all the way on home ground. 3rd in the Nove Mesto sprint in January. Nikita Kriukov – another strong Russian. Not the best results lately, but could still go all the way in these Olympics. Dario Cologna won the Skiathlon – and was 2nd behind Northug in the pre-Olympics last year. Is he fast enough after the injury problems? Still one of the big favourites on this course. Eirik Brandsdal. The Norwegian finished second in Toblach and 4th in Nove Mesto – a strong outsider. Italian Federica Pellegrino has 5 times Top 6 the last 9 World Cup sprints in free technique, and is one of the outsiders. Other outsiders: Teodor Peterson, Martti Julhëe, Marcus Hellner, Josef Wenzl, Andy Newell, Anton Gafarov. See below for historical results. Kikkan Randall has five wins and two second places in her last 8 starts in the World Cup in free technique sprint – and since 2010 she has only been outside the finals twice(!) – very impressive in a millimeter discipline like sprint. The big favourite here at the Olympics. Marit Bjørgen is the other big favourite. Bjørgen beat Randall in Toblach on this discipline just ahead of the Olympics, and has shown impressive shape lately with the Skiathlon win. The course should also fit Bjørgen well. Ingvild Flugstad Østberg has been very impressive in sprint lately – one victory and three times Top 3 in the last four free technique sprints she has started in. German Denise Hermann has been just as impressive as Flugstad Østberg – except the victory is missing. Six times in a row in Top 5 – with 2nd place in the two last free technique sprint races. Hanna Erikson took the victory in the free technique sprint in Oberhof, but has not impressed that much lately. Maiken Caspersen Falla is the only one except for Marit Bjørgen who has beaten Kikkan Randall in a free technique sprint the last seasons. Has not had full success in the sprints so far this season, but has now trained well and wants to show her shape. 4th in Toblach! Also look out for Jacobsen, Ingemarsdotter, Aurore, Kolb and Van der Graff. The Skiathlon opens up the Olympics for the Cross Country skiers in Sochi – the women ski 7.5 km + 7.5 km Saturday and the men 15+15 km Sunday. The Skiathlon is the discipline for the all-rounders who can perform well in both classic and free technique. With two techniques involved, there is more tactics in the Skiathlon than in regular mass start races. Note! Predictions for both men and women must be given ahead of the women’s start Saturday! There are few Skiathlons on the World Cup schedule – and not all of them attract a full start field. Thus the Skiathlon is one of the most open races in the World Champs with some “hidden” outsiders – especially in the men’s class. The Skiathlon in the pre-Olympics in Sochi last year did however have very strong start fields, and give an indication of who will want to be in the fight for the medals – but a lot has happened in a year. Note that this preview is written before the men’s start list was ready. Men: Norway against Russia and Switzerland? One year ago at the pre-Olympics in Sochi the two main favourites were Dario Cologna (SUI) and Petter Northug (NOR) – with Cologna winning and Northug finishing down in 12th place. A few weeks later at the World Champs in Val di Fiemme Cologna took another victory with Northug in 4th. Fast forward to today, and both Cologna and Northug have had problems with injuries and illness – and although both are still among the favourites, they are not as big favourites as they would have been with a perfect season run-up. However, Cologna is one of the top allrounders in the World Cup circus – mastering classic and free technique equally well. The Swiss won the last two Skiathlon World Cup races – and he showed with his 2nd place in Toblach last weekend that he is in shape! But is it good enough for 30 km – and is his sprint good enough in a mass start. The Norwegian Petter Northug used to be the man to beat in any mass start sprint finish, but lately his results have been better in interval start races. Still Northug is known to be able to take out all when it really counts – and he won the Skiathlon both at the World Champs is Olso in 2011 and in Liberec in 2009. Northug did, however, fail in the Olympics in Vancouver in 2010. Here Northug’s Swedish arch rival Marcus Hellner took the victory after good tactical play, with another good Skiathlon skier Tobias Angerer (Germany) in second spot. Hellner has had a bad season this year, but is still mentioned among the favourites. The tough skate part of the course in Sochi is also an advantage for Hellner. This year’s big skier Martin Johnsrud Sundby is another Norwegian favourite. Sundby finished 2nd in the World Champs Skiathlon in Val di Fiemme last year, and has shown impressive shape this year by winning the Tour de Ski and several World Cup races. Two of the biggest favourites in the Skiathlon mentioned among the experts are the Russians Alexander Legkov and Maxim Vylegzhanin. They are both consistent in Top 6 in the Skiathlon – but have few victories to show off. However, the home ground advantage must not be forgotten. Outsiders are the french Maurice Manificat and Roland Clara – both very capable of winning. Also include Sjur Røthe and Alex Harvey on the outsider list. In the women’s class the fight is yet again between Justyna Kowalczyk, Marit Bjørgen and Therese Johaug – with Charlotte Kalla mixing in due to some very good results this season. Kowalczyk has had a big weakness in free technique this season – but can still fight for a medal in a Skiathlon. The last four World Cup Skiathlon’s have had four different winners: Bjørgen, Johaug, Kowalczyk (limited start field Canmore December 2012) and Kristin Størmer Steira (limited start field Sochi pre-Olympics). Marit Bjørgen is still the big favourite, though. The Norwegian is reigning World Champion (from Val di Fiemme in 2013 and Oslo in 2011) and reigning Olympic Champion (Vancouver 2010) on the Skiathlon – and has shown that her shape is exceptional these days. She will definitely be hard to beat; Kowalczyk probably needs to get away already on the classic part to take the win – while Johaug needs to get away in the last uphill on the last loop of the free technique loop. This tactical play is what will make the Skiathlon very interesting to watch. Johaug’s weakness in the Skiathlon is her finish sprint – the Norwegian with the high frequency seldom wins a sprint finish against Bjørgen. Johaug has however shown earlier that she can decide earlier if the course is tough enough – and that might very well be the case in Sochi (although Johaug has said that she is disappointed by the courses not being tough enough). The last skier who has been mentioned as a possible gold medal candidate is Charlotte Kalla. Kalla needs top skis on the classic part – and a very good classic performance to be in on the fight for the gold medal. The conditions (hard snow) are however good for Kalla! Outsiders in the women’s class are Kristin Størmer Steira (winner of the pre-Olympic Skiathlon in Sochi, but without full competition), Heidi Weng, Anne Kyllönen, Nicole Fessel, Katrin Zeller. With national championships in Norway, Sweden and Finland, the start fields in the World Cup round in Szklarska Poreba, Poland this weekend are quite slim – with many of the big favourites missing. With two Olympic disciplines being organized in Poland, this is still an important test for the skiers present. The currently best woman free technique sprinter in the world – Kikkan Randall – is however on the start line. Challenging Randall is German Denise Herrmann who has been impressively stable in free technique sprint this season – in four of four possible finals (3rd, 2nd, 3rd and 5th). The victory is still missing though – will it come in Poland. Outsiders are Laurien Van der Graff (2nd in Czech Republic last weekend), Hanna Kolb, Gaia Vuerich and Sophie Caldwell. In the mens class three of the finalists from last weekend are on the start line Federico Pellegrino (2nd), Alexey Petukhov (3rd) and Nikolay Morilov (5th). Pellegrino has four finals of four possible this season in free technique sprint (twice 2nd) – and is the favourite for his first World Cup victory. Also look out for the Prologue specialist Andrew Newell, Alex Harvey, Josef Wenzl, Nikita Kriukov and Cyril Miranda. [Startlists are ready!] With free technique sprint on the program on February 11th in Sochi, there is a lot of focus on this discipline in the World Cup the coming month. The free technique sprint in Nove Mesto na Morave in Czech Republic this weekend is the first of three free technique sprints ahead of Sochi. Although some of the sprinters participated at the Tour de Ski, most of the pure sprint specialists have had a training period – preparing themselves for the important competition period ahead of the Olympics. On the other hand, several of the sprinters who participated in Tour de Ski have now got a rest period. Swedish Emil Jönsson – is hoping to show that he can do well also this season. In Davos in the middle of December he finished only 22nd. Italian Federica Pellegrino showed good shape at the sprints in Tour de Ski (4th and 2nd) – and was also 6th in Davos. An interesting skier in Nove Mesto. Anders Gløersen (Norway) won the Davos sprint – look out for this Norwegian who can move swiftly through the field towards the end of the race. Finn Haagen Krogh has been mentioned among the favourites all of the season – but has so far “only” two 5th places from Davos and Lenzerheide in free technique sprint. Has he recovered well enough after the first part of the Tour? Simon Hamilton won the sprint in Lenzerheide during Tour de Ski – was that only a one-timer – or can he play with the best again? There are several others who can win this sprint – among them Teodor Peterson, Ola Vigen Hattestad, Martti Julhëe, Sergey Ustiugov. In the women’s class most of the top sprinters were at the Tour de Ski – and several of them jumped off before the end. Notably absent at the Tour was Kikkan Randall – the big favourite in Nove Mesto. Randall has four wins and two second places in her last 6 starts in the World Cup in free technique sprint. The big, big favourite both here and at the Olympics. Ingvild Flugstad Østberg was very impressive at the Tour de Ski – winning in Lenzerheide and 3rd in Oberhof. German Denise Hermann was just as impressive as Flugstad Østberg – racing well in qualification and heat after heat. Finishing 2nd in Oberhof and 3rd in Lenzerheide. Hanna Erikson took the victory in Oberhof, and has the series 7 – 1 – 4 in the three free technique sprints organized so far this season. Maiken Caspersen Falla is the only one except for Marit Bjørgen who has beaten Kikkan Randall in a free technique sprint the last year. Has not had full success in the sprints so far this season, but has now trained well and wants to show her shape. Also look out for Ingemarsdobber, Aurore, Brun-Lie, Kolb and Van der Graff. The Final Climb turned into a Norwegian celebration also in the Men’s class with Martin Johnsrud Sundby on top ahead of Chris Jespersen – but the Austrian Johannes Duerr impressed again with best stage time, best climb time and taking the third place overall in the Tour de Ski! 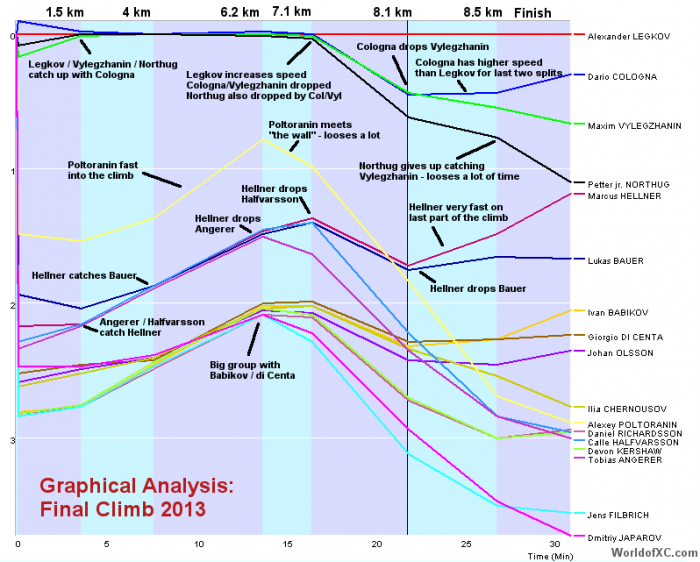 The above illustration is a graphical analysis of the race development based on the split times. A line which is flat means that a skier has the same time as Martin Johnsrud Sundby for the split (Sundby’s line is flat all the way on the top). A line which goes down represents slower speed – a line which goes up represents faster speed. Key moments are marked on the illustration. Sundby alone in the lead all the way. Steadily loosing time to Jespersen, but never in danger. Jespersen catches Northug at around 6 km (bottom of the hill) and leaves him soon after. Jespersen is faster than Sundby nearly all the way – closing the gap down to 36 seconds in the end. Duerr forms a group with Chernousov and Halfvarsson. The group looses time in the flat part until 6 km – nearly 45 seconds is lost. Legkov and Roethe catch the group just at the bottom of the hill. At the start of the hill, Duerr speeds up and only Chernousov dares to keep up his speed for some hundred meters. However the speed increase is too tough for Chernousov, and after Chernousov has to let Duerr go, he looses a lot of time and is passed by both Roethe and Legkov. Duerr continues to have the highest speed in the field all the way to the top – and passes Northug to take the third spot in the overall. Roethe leaves Legkov early in the hill, finishing in 7th. Rothe nearly caught Northug – but had a few seconds left when arriving at the top of Aple Cermis. Looking at the stage times (see list below), Johannes Duerr won the stage 4 seconds ahead of Chris Jespersen – even with the slow start. In the climb itself, Duerr was exceptionally fast – winning the climb in 16:46 – 45 seconds ahead of Babikov with Roethe a few seconds behind. FIS has again published GPS-data for the race – making it possible to follow the race development in detail. Below parts of the race development is described based on the GPS-data. This illustration which is based on the GPS-data shows a comparison between Sundby and Jespersen. The red line shows how far Jespersen is behind Sundby as a function of time. 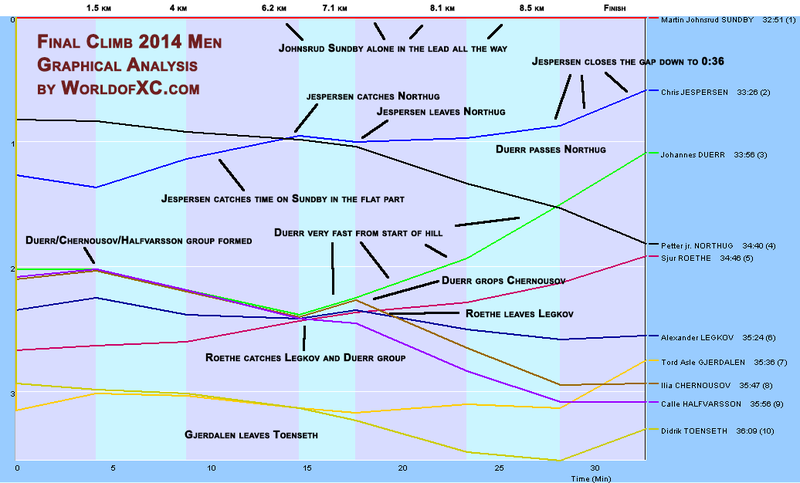 From the illustration one can see how Jespersen closes in on Sundby all the way until 5 km. The gap is constant between 5 km and 8 km – and then Jespersen closes in another 25-30 second the last km (at this time Sundby probably knew that the victory was his – while Jespersen was still securing his second spot). Here you see how Jespersen starts 35 seconds behind Northug, and catches him just after 5 km. They ski together the first part of the hill (until 7 km), where Northug has to let Jespersen go. Duerr had a small possibility to catch Jespersen and take second spot, but lost too much time in the flat part. If the Duerr-group would have worked well together in the flat part, this could have been a second spot for Duerr. However, Duerr was too much of a favourite in the climb – the others were not interested in helping him. Duerr loses a few seconds to Northug the first 7 km (the flat part and the first part of the hill), and then is a lot faster when the hill really starts. Duerr speeds down briefly when catching Northug around 8.3 km – but then races on towards Jespersen. Chernousov stayed with Duerr until the hill started to get really steep around 7 km – then it was good bye! Legkov worked hard in the flat part to catch Duerr – and eventually managed to catch the Austrian at the start of the hill around 6 km. Legkov managed to keep up in the flatter part of the hill – but then it was good bye to Legkov a bit before Chernousov. Røthe looked like he could be fighting for third place when he nearly caught Duerr at the bottom of the hill around 6 km – but in the hill Røthe didn’t have a chance! The Final Climb turned into a Norwegian celebration in the Women’s class in this edition of the Tour de Ski. As expected Therese Johaug was stronger than Astrid Jacobsen and took the overall victory. However Jacobsen gave Johaug a fight nearly all the way to the finish – and Johaug’s gap down to Jacobsen was only 20 seconds in the end. 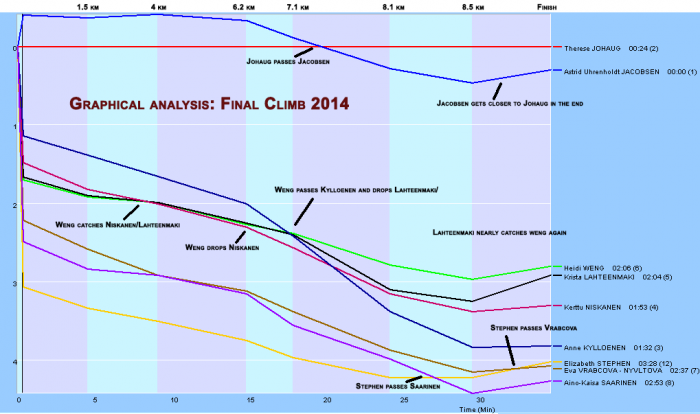 Looking at the illustration above you see the key moments in the race: How Johaug passes Jacobsen between 7 and 8 km, how Weng beats the Finnish trio for the third place and how Stephen advances to 7th place. The illustration above is a graphical illustration of the race development based on the split times. A line which is flat means that a skier has the same time as Therese Johaug for the split (Johaug’s line is flat all the way on the top). A line which goes down represents slower speed – a line which goes up represents faster speed. Key moments are marked on the illustration. Looking at the stage times Johaug crushed everybody on the stage as she has done four times before. Johaug won the stage 44 seconds ahead of Jacobsen with Elizabeth Stephen (USA) in third. Looking at the final climb only (just the hill), Stephen was second – only 16 seconds behind Johaug with Weng and Ishida in shared third at +34 seconds. The below illustration compares Jacobsen and Johaug. When the red line is below the thick black line, Johaug is behind Jacobsen – when it is above Johaug is in front. 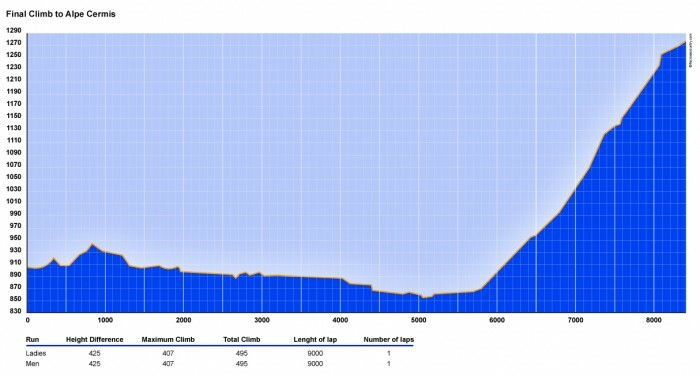 As you can see that the gap is constant all the way until 6 km where the hill starts. From 6 km Johaug starts to “eat up” the gap – catching Jacobsen at 7.4 km. Johaug only stays at the back for a few meters before getting away and quickly building up a big gap. The gap is at 30 seconds at its maximum – but then drops to around 20 seconds in the end. The first of the illustrations below compare Weng with Lahteenmaki. As you can see Weng catches Lahteenmaki after around 1 km of skiing. They then stay together until around 6.5 km where Weng gets a small gap. Lahteenmaki hangs on until 7.3 km though – but then Weng quickly gets a gap of 20 seconds. Towards the end Lahteenmaki catches Weng again (but as we know Weng was faster in the finish sprint). The Final Climb up Alpe Cermis is the toughest race in the Cross Country Skiing World Cup – a highlight for Cross Country skiing fans! Norwegian skier Therese Johaug is the Queen of the Alpe Cermis with four stage wins – undefeated since 2009 . In the men’s class not all of the best climbers are at the start – but of the ones starting Alexander Legkov (RUS), Ivan Babikov (CAN), Johannes Duerr (AUT) and Thomas Moriggl have shown the most impressive results earlier. 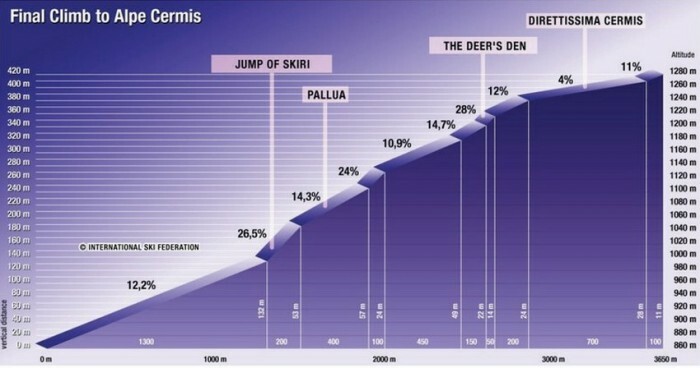 The Alpe Cermis has a height difference of 425 meters – and the total climb on the stage is 495 meters. The women and men race the same course (9 km skating). The final Tour de Ski stage is not all about the climb though. Before the climb starts, there is a 5.5 km “warm-up” down the valley (see profile below) which is also very important for the stage time and for the overall result. With the tough race profile of Alpe Cermis, motivation and position in the field relative to other skiers is often just as important as pure strength. In the overall Tour de Ski predictions, Roar has increased his lead – now at 3374 points with Lars Ola Thorud in second with 3338 points and Sportsamuel in third with 3311 points. They all have skiers in their overall tip who have skipped the tour though- so there might still be significant changes in the top. For example Roar has Bjørgen as overall Tour winner. In the men’s class Martin Johnsrud Sundby is the big favourite for the overall victory with his 48 seconds lead to Petter Northug in second and 1:27 down to Chris Jespersen in third. Sundby has only raced the Final Climb in 2010 and 2009 – finishing respectively 1:50 (26th place) and 1:30 (27th place) behind the winner. However, Sundby is a very strong climber as he for example showed in the roller ski race “Lysefjorden Opp” last August (Norwegian text article here) where he finished 3rd – only 4 seconds behind expert climber Roland Clara in 2nd and ahead of good climbers like Manificat and Heikinen. Northug has typically lost a minute or more on the final tour stage – his best year being 2011 when he lost only 39 seconds to the stage winner Bauer and only a few seconds to climbing specialist Clara who was the second best on the stage. Northug has just become better and better during this edition of the Tour – winning the classic interval start race in Val di Fiemme on the second last day of the Tour. Generally he has not had his strength in the climb, but according to Northug he can race the hill better than he has earlier as he now is at his “match weight” (Norwegian text article here). Still it will be tough catching Sundby – but good chances for the overall Top 3 are definitely there. Jespersen is more of an unknown in the final climb – not having raced the stage earlier – but the Norwegian who is third in the overall is not one of those small mountain-goats. Still he should be able to give Northug a fight for the Top 3. The biggest challenge for the three Norwegians at the front of the field is Austrian Johannes Duerr – a climbing specialist starting 2 minutes behind Sundby in 5th (Canadian Harvey is in 4th overall – but not as strong a climber). Duerr did an impressive race on the Cortina-Toblach stage – winning the stage clearly. Duerr did also impress on the Final Climb last year – finishing the stage with the fourth best stage time and with the 2nd best time up the climb part of the stage. The next strong climbers on the start list are Alexander Legkov at 2:21 (8th place), Sjur Røthe at 2:40 (9th place), Didrik Tønseth at 2:56 (11th place), Jean Marc Gaillard at 3:37 (17th), Ivan Babikov (21st at 4:38), Matti Heikkinen (42nd at 6:57), Martin Bajcicak at 9:34 (50th), Thomas Moriggl at 9:56 (51st). Of these Legkov has the most impressive results with his stage win in 2012 and his impressive performance last year when he decided the tour in the climb (but took it easy in part of the stage, only finishing 10th). Also look out for Babibov who had second best stage time last year, climbing specialist Moriggl with 5th best time the two last years and Sjur Røthe who is very strong in the hills when he is in good shape. Tønseth is also a dark horse in the climb – being a very strong climber. The graphical analysis from the men’s Final Climb last year below shows how groups further back in the field can gain many seconds in the first part of the course (when a line slopes upwards a skier gains time on the winner Legkov – when a line slopes downward a skier looses time) until the hill starts. Last year Legkov decided the race early in the hill where he set up an impressive pace which none of the others could match. See historical results table further down. In the women’s class Therese Johaug is the big favourite for the overall victory – starting only 24 seconds behind leading Astrid Uhrenholdt Jacobsen with the Finnish trio Kolloenen, Niskanen and Lahteenmaki chasing at 1:31, 1:52 and 2:03 respectively. Behind these five is the last real challenge for the Top 3 overall – Norwegian Heidi Weng. Therese Johaug is undefeated on the final Tour de Ski stage since 2009 – winning with four times (2013, 2012, 2011 and 2009) and not competing in 2010. The last three years Johaug has won with between 40 and 60 seconds – the competition coming 10 seconds closer each year. Astrid Uhrenholdt Jacobsen proved last year that she can be a strong climber with her 6th place – but still with more than 1:30 up to Johaug. The Finnish trio should not be a real challenge for Jacobsen – but Jacobsen needs a small miracle to beat Johaug. Lahteeenmaki is the strongest climber in the Finnish trio – finishing 4th (at +1:34) last year and regularly performing well on this stage. Kylloenen and Niskanen have struggled more – finishing between 2:30 and 4 minutes behind on the stage the last two years. Heidi Weng is a very strong climber when in good shape – finishing 3rd on the stage last year. With a good race setup – catching the Finns – she could even go for the stage win if everything fits. The next strong climber on the start list is Elizabeth Stephen (14th at 3:27) – who finished 2nd last year. A very strong climber who fill fight for the stage win. The 6th and second last stage in this year’s Tour de Ski is a classic technique interval start race over 5/10 km on a quite tough course with around 170 meters of climb per lap (2 laps for men / 1 lap for women). With the skiers having 6 tough races in their legs, the time differences might be bigger in this race than usually in this type of race. The overall leader Martin Johnsrud Sundby is also one of the favourites in the 10 km classic race with his current excellent shape. At the corresponding 10 km classic race in Kuusamo in November the Tour leader finished 5th – only 12.6 seconds down on the winner Lukas Bauer. Among the Top 10 in Kuusamo, only Bauer (1st), Sundby (5th), Jespersen (7th), Tscharnke (9th) and Legkov (10th – 29.5 seconds behind) are competing in Val di Fiemme. Legkov does however have a strong history in classic interval start races. Other skiers strong in this discipline are Didrik Tønseth (3rd in 15 km classic interval start in Lillehammer in December last year), Petter Northug (won the 15 km classic in the World Champs in Val di Fiemme last year), Ilia Chernousov (no good results in this discipline in 2012/2013 or 2013/2014, but has earlier been stable in Top 8). Regarding the overall tour standings, Sundby has a good chance to keep the gap down to his competitors at at least 30-40 seconds also after this stage – and maybe even increasing it if he is fully recovered after the Cortina-Toblach stage and has a good day. Note that there are again 15 – 10 – 5 bonus seconds to Top 3 – and thus this race might give quite significant time differences. Astrid Uhrenholdt Jacobsen has the overall lead with 44 seconds down to Therese Johaug in second spot. These two Norwegians are also the biggest favourites for this race based on earlier results – with Johaug having a slight edge over Jacobsen. Johaug finished 2nd in the Kuusamo 5 km classic race – 17 seconds ahead of Jacobsen in 8th. Jacobsen has however showed impressive shape the last days – and is mentally strong – and thus this fight might be very close. It will also be very important for the overall – as Jacobsen should have a lead of at least a minute to Johaug ahead of the final climb to feel safe. For the stage victory, also count in the very strong Finnish classic skiers Lahteenmaki (6th in Kuusamo), Niskanen (13th in Kuusamo – but won the classic 10 km mass start in Toblach a few days ago), Saarinen (bad race in Kuusamo, but shows improving shape) and Kylloenen (17th in Kuusamo) in the fight for the stage victory – as well as Heidi Weng (8th in Kuusamo) who starts to get in good classic shape. World Cup Opening: WhoWins the Ruka Triple? 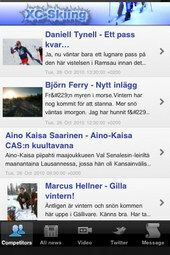 New iPhone App keeping you up to date on everything within Cross Country Skiing!